Backed by US development aid, the Ethiopian government is seizing land, demolishing homes and cracking down on activists in a bid to expand its capital city. Yehun and Miriam have little hope for the future. Like the other residents of Legetafo—a small, rural town about twenty kilometers from Addis Ababa—Yehun and Miriam are subsistence farmers. Or rather, they were, before government bulldozers demolished their home and the authorities confiscated their land. The government demolished fifteen houses in Legetafo in July. The farmers in the community stood in the streets, attempting to prevent the demolitions, but the protests were met with swift and harsh government repression. Many other Oromo families on the outskirts of Ethiopia’s bustling capital are now wondering whether their communities could be next. The plan intends to integrate Addis Ababa with the surrounding towns in Oromia, one of the largest states in Ethiopia and home to the Oromo ethnic group—which, with about a third of the country’s population, is its largest single ethnic community. While the plan’s proponents consider the territorial expansion of the capital to be another example of what US Secretary of State John Kerry has called the country’s “terrific efforts” toward development, others argue that the plan favors a narrow group of ethnic elites while repressing the citizens of Oromia. Yehun, a 20-year-old farmer from the town, said the community was given no warning about the demolitions. “I didn’t even have time to change my clothes,” he said sheepishly. Yehun and his family walked twenty kilometers barefoot to Sendafa, where his extended family could take them in. Opponents of the plan have been met with fierce repression. A small scar above his eye, deafness in one ear and a lingering gastrointestinal disease picked up in prison testify to Fasil’s commitment to the cause. His injuries come courtesy of the police brutality he encountered during the four-year prison sentence he served after he was arrested for protesting for Oromo rights in high school and, more recently, against the IMP at Addis Ababa University. Fasil is just one of the estimated thousands of students who were detained during university protests against the IMP. Though Fasil was beaten, electrocuted and harassed while he was imprisoned last May, he considers himself lucky. “We know that sixty-two students were killed and 125 are still missing,” he confided in a low voice. The controversy highlights the disruptive and often violent processes that can accompany economic growth. “What is development, after all?” Fasil asked me. Ethiopia’s growth statistics are some of the most impressive in the region. Backed by aid from the US government, the Ethiopian People’s Revolutionary Democratic Front (EPRDF), the country’s ruling coalition, is committed to modernizing agricultural production and upgrading the country’s economy. Yet there is a lack of consensus about which processes should be considered developmental. Oromo activists allege that their community has borne a disproportionate share of the costs of development. Advocates like Fasil argue that the “development” programs of the EPRDF are simply a means of marginalizing the Oromo people to consolidate political power within the ruling coalition. “Ethiopia has a federalism based on identity and language,” explained an Ethiopian political science professor who works on human rights. Nine distinct regions are divided along ethnic lines and are theoretically granted significant autonomy from the central government under the 1994 Constitution. In practice, however, the regions are highly dependent on the central government for revenue transfers and food security, development and health programs. Since the inception of Ethiopia’s ethno-regional federalism, the Oromo have been resistant to incorporation in the broader Ethiopian state and suspicious of the intentions of the Tigray ethnic group, which dominates the EPRDF. As the 2015 elections approach, the Integrated Master Plan may provide a significant source of political mobilization. 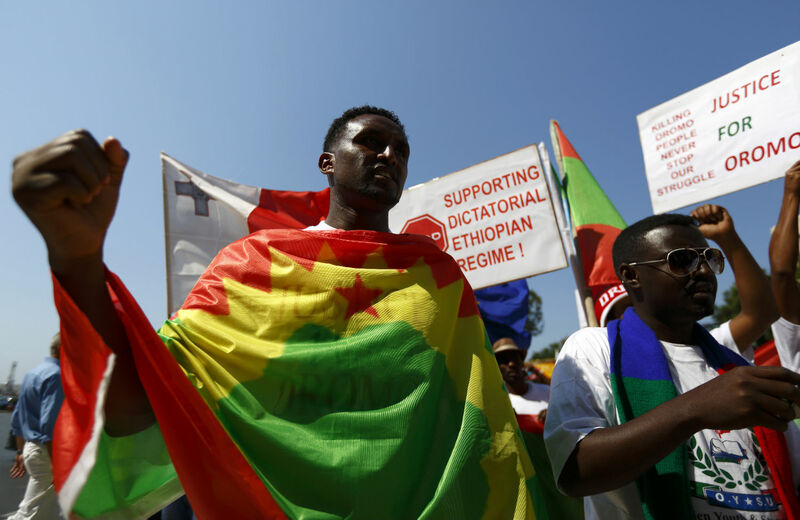 “The IMP is part of a broader conflict in Ethiopia over identity, power and political freedoms,” said the professor, who requested anonymity. Kerry asserted that “the United States could be a vital catalyst in this continent’s continued transformation.” Yet if “transformation” entails land seizures, home demolitions and political repression, then it’s worth questioning just what kind of development American taxpayers are subsidizing. The American people must wrestle with the implications of “development assistance” programs and the thin line between modernization and marginalization in countries like Ethiopia. Though the US government has occasionally expressed concern about the oppressive tendencies of the Ethiopian regime, few demands for reform have accompanied aid. For the EPRDF, the process of expanding Addis Ababa is integral to the modernization of Ethiopia and the opportunities inherent to development. For the Oromo people, the Integrated Master Plan is a political and cultural threat. For the residents of Legetafo, the demolition of their homes demonstrates the uncertainty of life in a rapidly changing country. Hilary MatfessHilary Matfess is a graduate student and independent researcher at the Johns Hopkins University’s School of Advanced International Studies.